Hello folks! Are you all in the mood for some more holiday card ideas? I've got a few Paper Smooches cards to drop today, and I've got two holiday and one "anytime" card. 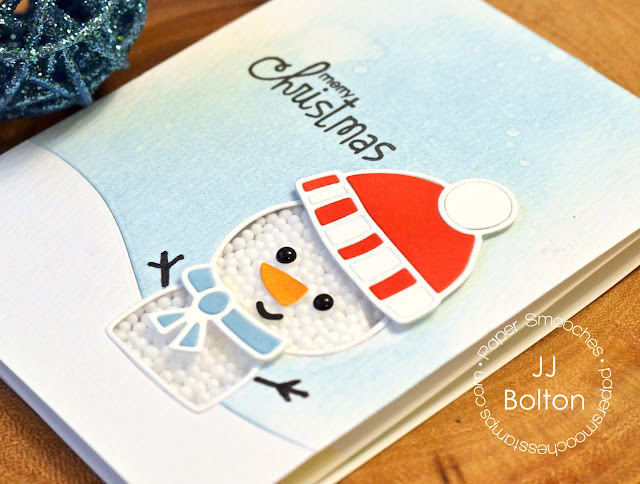 This first one uses the fun Snowman 2 dies. 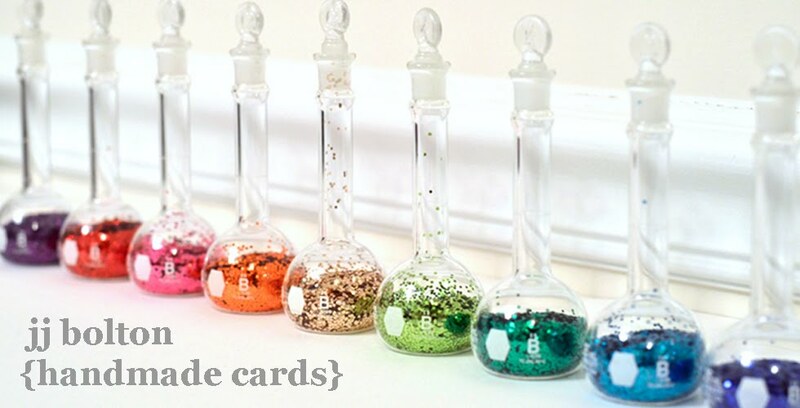 I love these outline dies because they make it so easy to make shaker cards! As you can see in this close up, I added a couple extra touches to my snowman by drawing in his arms with a marker and substituting paper eyes with black enamel dots. This was such a fun card to make! Here's another holiday card for you! I used the Evergreens dies. This card shows you how versatile those outline dies can be when you just use the inside of the dies. 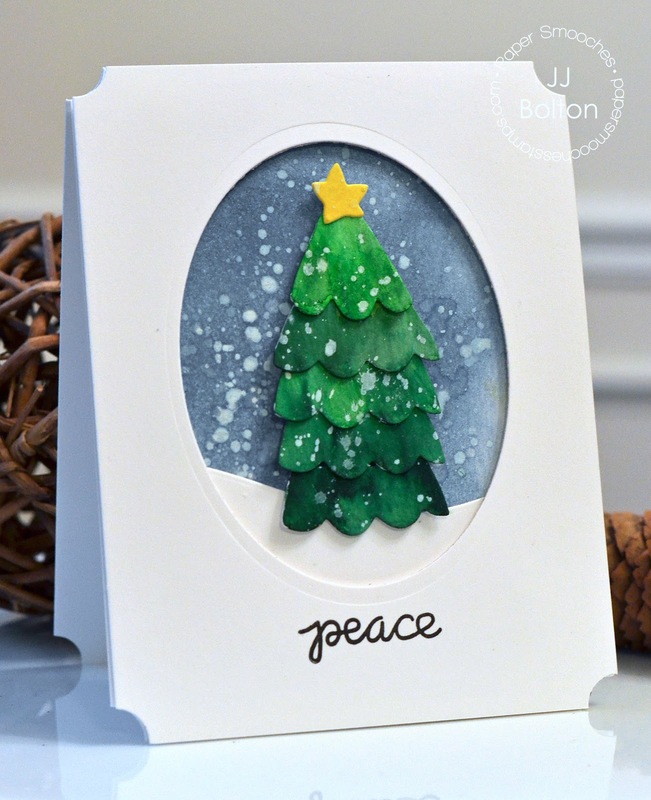 I layered multiple die cuts to create a larger tree. Each tier is colored with watercolors and the whole thing was misted with white ink. The background sky is just blended ink. I really wanted to focus on the tree, so I created a frame with the oval reverse cut and the stub punched corners. 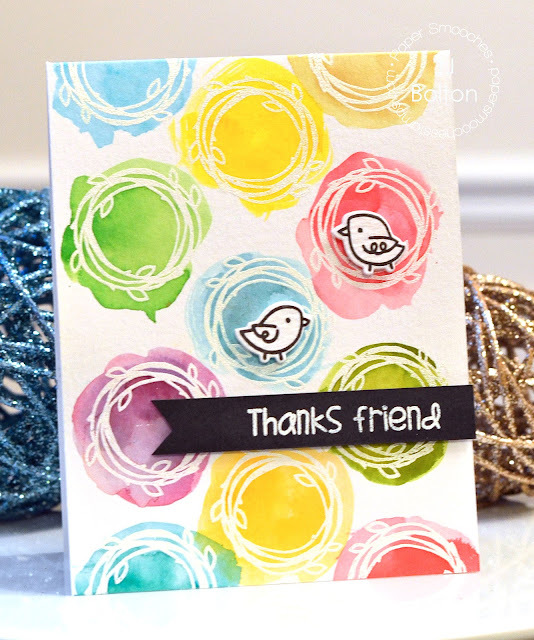 This last card is not a holiday card, and made a quick colorful card using the Natural Beauties stamps and dies. My goodness is this set ever cute!!! I heat embossed the wreaths and then loosely colored each one with my watercolors (the Peerless watercolor papers if you're wondering). Love all your cards, JJ. Wow, so much one can do with the Fuse tool. Thanks for sharing how you made the snowman. JJ! These are adorable...especially that cute snowman! eek these are fantastic. the snowman is so cute I can't stand it! 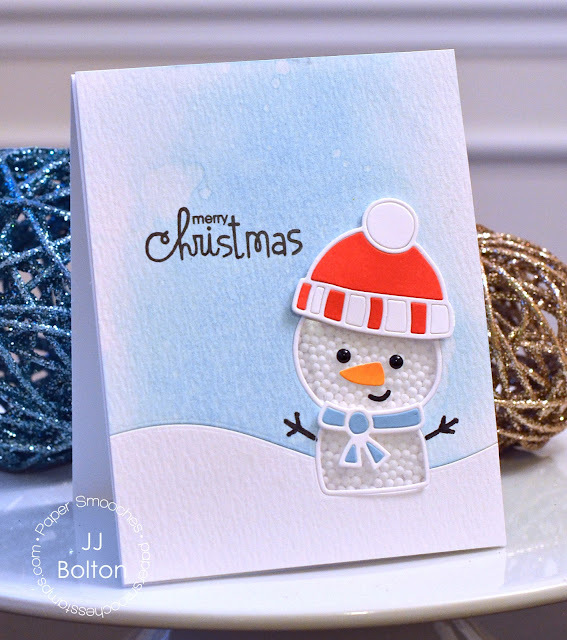 Love your adorable snowman! Thanks for the tip on filling the fused pocket. I love that you filled up the snowman with the styrofoam balls! 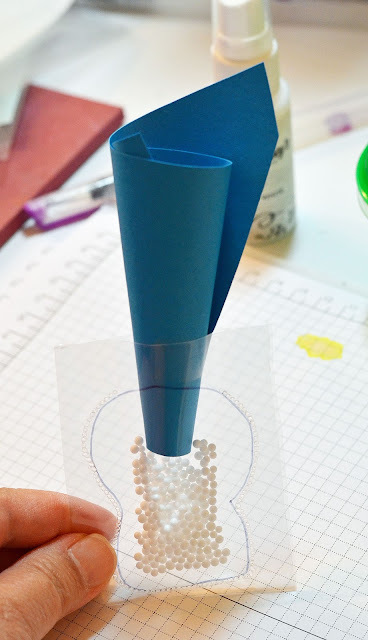 Such a fun die and love your use of styrofoam balls! Really enjoy scrapbooking and card making. And enjoy all the tools we get to buy too! Cool effect with the cut out birds and watercolor!! great ideas very cute cards.